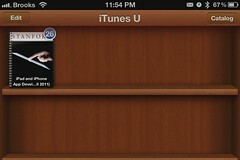 Has you used the iTunes U App on iPad and iPhone yet? 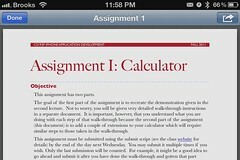 It was announced by Apple when they announced the iBooks' Textbooks and the iBooks Author tool. It is pretty cool! 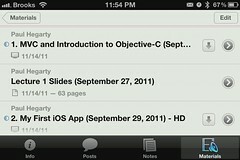 I am attending a Stanford University "iOS Development" class right from the comfort of my home - AND for FREE! Monday is my new "class" day for this course. I have the lectures (Videos), the slides (PDF), and homework assignments (PDF) available for downloading and viewing. I have them loaded in my iTunes on the iMac. I can watch it on the iMac, but then my screen real estate gets used up. 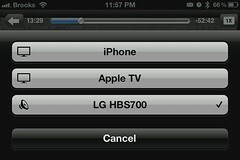 WIth the Apple TV, I send the video from the iMac (did you know there is an Apple TV button in iTunes - on the Mac at least) to the 50" HDTV. 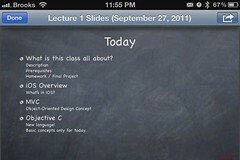 This allows me to view the slides and\or assignments on the iMac. 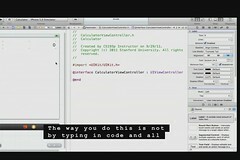 Additionally I can follow along with the instructor in Xcode and build the code as I watch. 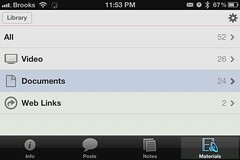 I have all the same material on my iPad and iPhone, so I can review the material anywhere. Now I am wish I had gotten a MacBook Pro instead of the iMac. Either way this is very nice. I have recommended the iTunes U for as long as it has been available on iTunes, but with the new course material added and the mobility of the content to the iOS devices makes this a no-brainer for anyone interested in learning a new subject. The App is FREE and so is the Material from Standford. 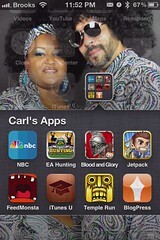 If you haven't checked out the iTunes U app in the AppStore, you should.